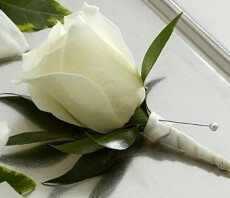 White Calla Boutonniere is the picture of elegant sophistication. 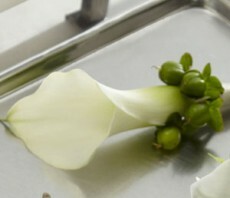 A single full-sized white calla lily is chosen for its absolute perfection and accented with green hypericum berries and a white satin ribbon to complement any wedding or graduation style. 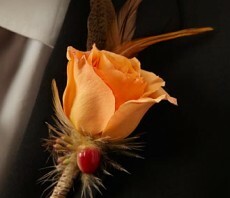 Approximately 5"H x 2"W.
Glorious Boutonniere is an elegant way to bring a soft sophistication to the overall look of the men in your wedding party. 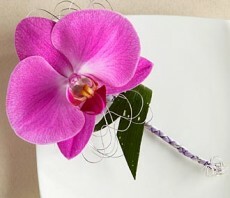 A single fuchsia phalaenopsis orchid bloom is accented with fresh greens, lavender French taffeta ribbon, and silver and purple wire to create a noticeably dramatic look of elegance and distinctive grace. 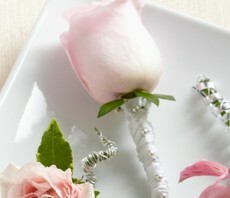 Approximately 7"H x 4"W.
Pink Cymbidium Boutonniere brings a fresh elegance to the look of your wedding party. 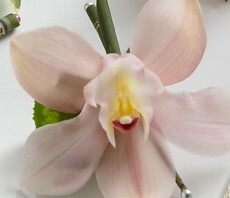 A single Cymbidium Orchid bloom is secured to an equisetum stem and accented with a cyclamen leaf to bring a simple style of blushing sophiistication to your big day. 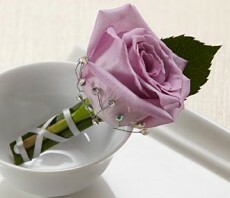 Approximately 4"H x 4"W.
Purple Passion Boutonniere is a gorgeous accent piece for your groomsmen. 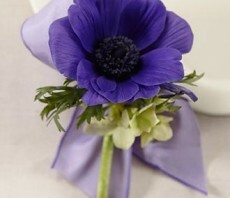 A single purple anemone stem is accented with green mini hydrangea blooms and lavender French taffeta ribbon to create a distinguished look. 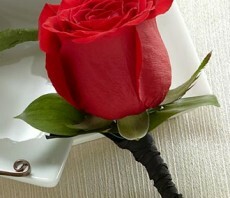 Approximately 4"H x 3"W.